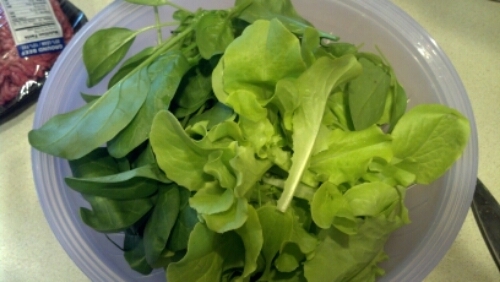 In our cold frame, we grew lettuce, spinach, cilantro, carrots and chard. We planted it in early December and it started to come up in March. I didn’t think the carrots would come up but they sprouted and are growing fast. Tonight we had taco salads with our lettuce and spinach. Yesterday, I cut some cilantro for the rest of my mom’s enchilada casserole so really, that was the first produce of the season, but I was so excited that I forgot to take a picture. The salad was delicious and I really like the both the lettuce and spinach. The lettuce is buttercrunch which I like so much better than black-seeded simpson–although I did plant some to mix in with other varieties. The simpson is too bitter whereas the crunch is the perfect mix of iceberg and romaine flavors. YUM!